If you're obsessed with relaxed dressing when it comes to fashion, you'll love this cute pairing of a black bodycon dress and Kate Spade new york pick a posy stud earrings. Up the cool of your getup by rounding it off with black leather pumps. 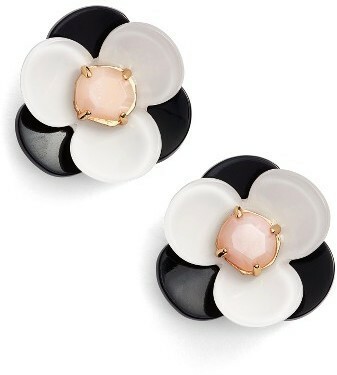 Reach for a black leather biker jacket and Kate Spade new york pick a posy stud earrings to be both casual and neat. To add oomph to your outfit, round off with black leather heeled sandals. Choose a grey check biker jacket and Kate Spade new york pick a posy stud earrings from Nordstrom to be both casual and neat. Dress in a multi colored floral skater dress and Kate Spade new york pick a posy stud earrings to be both casual and neat. Up the cool of your outfit by completing it with white and black leather heeled sandals. We all look for comfort when it comes to dressing up, and this combination of a red blazer and black earrings is a practical illustration of that. When it comes to footwear, this look is round off wonderfully with black leather gladiator sandals. If you're all about relaxed dressing when it comes to fashion, you'll love this totaly stylish pairing of a burgundy coat and Kate Spade new york pick a posy stud earrings from Nordstrom. Up the cool of your outfit by finishing off with black leather loafers. If you're a fan of practicality dressing when it comes to fashion, you'll love this adorable pairing of a red coat and Kate Spade new york pick a posy stud earrings. Add a glam twist to your ensemble with black leather lace-up ankle boots. If you're obsessed with practicality dressing when it comes to fashion, you'll love this super cute pairing of a black off shoulder top and Kate Spade new york pick a posy stud earrings from Nordstrom. We all outfit for comfort when it comes to dressing up, and this combination of a tan leopard fur coat and black earrings is a practical example of that. Wearing a pair of black suede pumps is an easy way to add some flair to your outfit.